Watch out, Luke! Darth Vader and his TIE Fighter escorts are hot on your tail and primed to blast you to oblivion. 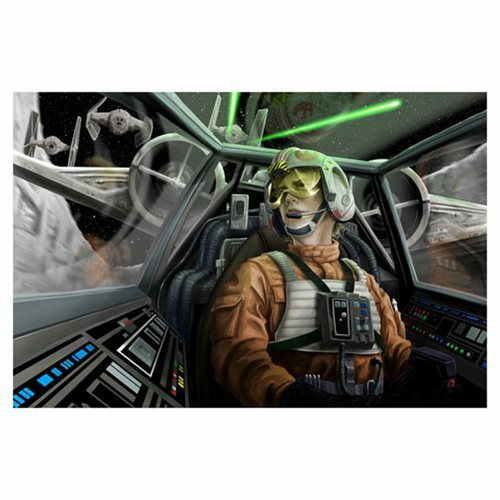 This Star Wars Baptism by Fire by Scott Zambelli Canvas Giclee Print is a beautiful interpretation of that intense and scary scene from the original Star Wars: Episode IV - A New Hope film when Luke is trying to blow up the Death Star. A limited edition of 95 pieces on canvas hand-numbered and signed by the artist, this fantastic piece of art belongs as a centerpiece in your collection! Comes complete with certificate of authenticity and measures 24-inches wide x 16-inches tall.